Earn rewards like gift cards, products and magazine subscriptions. Plus, earn bonus points for every ROGAINE® Subscribe purchase. Enroll at checkout! ROGAINE® is the #1 Dermatologist Recommended hair regrowth treatment. When you use Women's ROGAINE® Foam every day, you can revive hair follicles to regrow thicker, fuller, younger-looking hair. 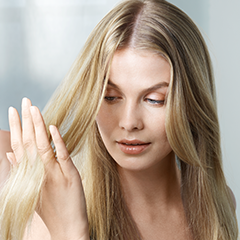 Easy to use: apply hair regrowth foam to scalp once a day. Clinically proven to regrow hair in over 80% of women*. FDA-approved foam contains 5% minoxidil and soothing botanicals. Patented Tricho-Prime TM technology starts to work on contact. No topical hair loss treatment works faster to regrow fuller hair. Satisfaction Guaranteed**: If you're not fully satisfied we'll refund your purchase price, no questions asked! Regrow thicker, beautiful hair with Women's ROGAINE® Hair Regrowth Treatment, Once-a-Day Foam. Containing 5% minoxidil, this foam reactivates hair follicles to regrow hair. The only once-daily hair regrowth treatment for women approved by the FDA, this formula is proven to help regrow hair in 81%* of women, with clinical results in as little as 12 weeks and visible results with continuous daily use after 24 weeks. From the #1 dermatologist recommended brand, the once-a-day applied foam can fit into your regular beauty routine. This package of Women's ROGAINE® Foam includes one 60-gram can, a 2-month supply. * in a 6-month placebo controlled clinical study. ** based on mean hair strand diameter. Active ingredient: Minoxidil 5% w/w (without propellant). To regrow hair on top of the scalp. Extremely Flammable: Avoid fire, flame or smoking during and immediately following application. May be harmful if used when pregnant or breast-feeding. Keep out of reach of children. If swallowed, get medical help or contact a Poison Control Center right away. you are under 18 years of age. Do not use on babies or children. it takes time to regrow hair. Results may occur at 3 months with once daily use. For some women, you may need to use this product once a day for at least six months before you see results. the amount of hair regrowth is different for each person. This product will not work for all women. Defy hair loss with ROGAINE®, the #1 dermatologist-recommended, FDA-approved brand with a clinically proven formula to regrow hair. Unlike thickening shampoos that temporarily coat the hair, ROGAINE® penetrates deep into your scalp to revive follicles and increase protein production so you can grow new, fuller, thicker hair. The revolutionary formula begins to work on contact with patented Tricho-Prime™ Technology, a proprietary combination of ingredients that primes your scalp for optimal hair regrowth. ROGAINE® Foam is so simple to use, and fits easily into your daily routine. As the foam acts on your scalp, it revitalizes hair follicles that have become dormant, so you can regrow new hair. Follow these quick steps, and for best results remember to use it every day. Start with dry or damp (not wet), towel-dried hair. Part your hair in a few rows to maximize scalp exposure. Hold the can upside down and dispense half a capful of foam onto clean, dry fingers or a non-porous dish (apply once a day as directed). Gently massage into your scalp where hair is thinning. Allow foam to absorb and air dry completely before blow-drying or styling your hair. Use only the recommended dosage of half a capful, once a day for Women. Using more or more frequently will not enhance or hasten hair growth. Continued use is necessary to improve and maintain your hair regrowth, or hair loss will begin again. Still have questions? Click Here to contact us by email. Be Patient — It Really Works! ROGAINE® is the 1st and only FDA-approved product proven to regrow hair. In clinical studies, nearly 9 out of 10 men noticed results after using ROGAINE®*, and more than 80% of women increased their hair count. You’ll begin to see results in 3-6 months, and remember to keep using ROGAINE® in order to keep your hair regrowing. Like many good things, patience and perseverance are the key to success using ROGAINE®. You can follow your normal hair care routine when using ROGAINE®. Just be sure to apply ROGAINE® first and wait for it to dry before applying styling products. ROGAINE® is safe to use on color treated or chemically treated hair. Just remember to skip using on the day you have a chemical treatment.